Hello everyone, Alison here, and delighted to be offering up our third Sponsor Spotlight for April. 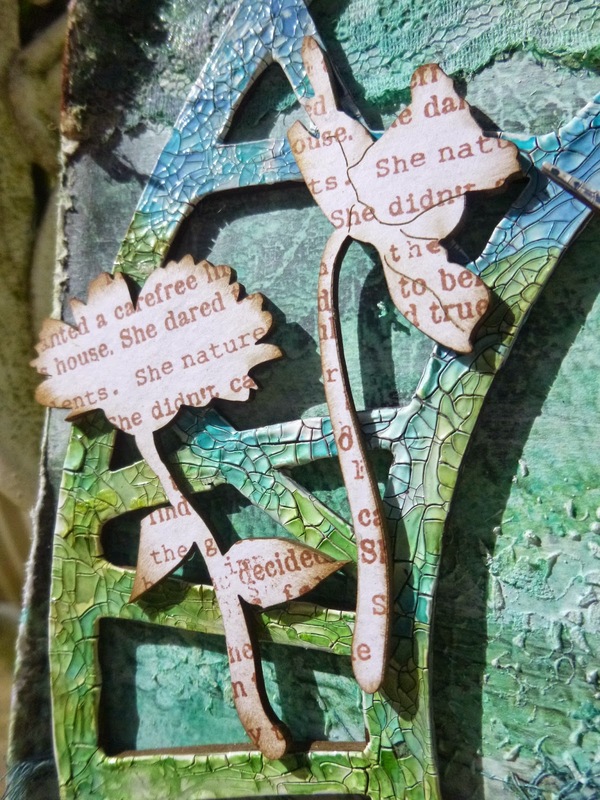 I'm sharing a project created with some of the wonderful products available from our generous sponsor this month, Tando Creative. This is photo-heavy, so grab a cup of coffee, sit back and enjoy the ride! And dimension and words aplenty. I started by coating the largest of the clocks with Croco Crackling Colour by Viva Decor. 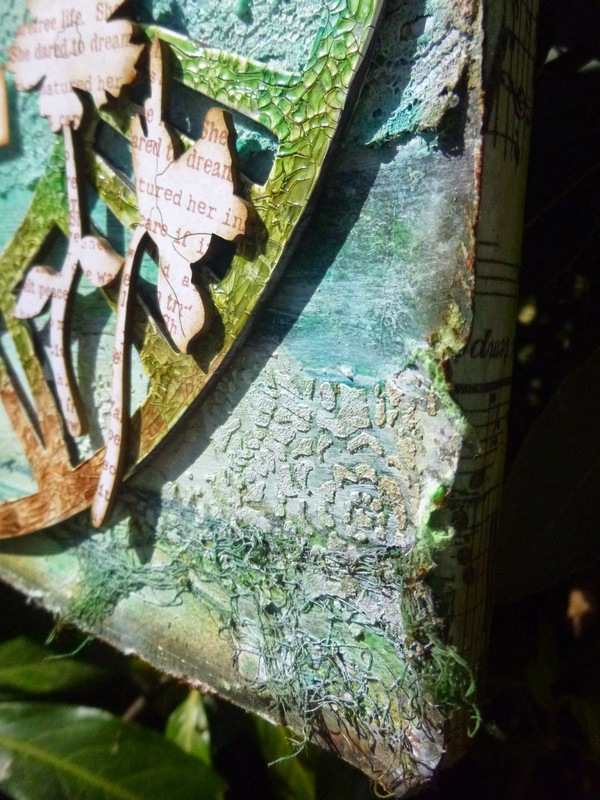 My medium is actually white, so once it was all dry and crackled I applied Distress Stains in lots of colours from nature... starting with earthy browns at the bottom, working up through the leafy, grassy greens, to blue skies at the top. I spritzed with water as I went to allow the colours to mix and blend on the surface. I made sure I had the clock hands approximately in position (I generally go with ten to three - "is there honey still for tea?") so that I could see where the colours needed to go, and gave them the same treatment. They're fastened together with one of the Prima industrial effect brads. I'd originally been thinking of creating some sort of hanging mobile, but when push came to shove, I realised it would be tricky to get the hands in the right place and so on. So instead, I decided to mount the clock on a 12 x 12 canvas. (That should tell you how big the largest clock is!) You can see an early draft here... the untreated clock and flowers, with a plan to "hang" the clock on a "tree"! ... but I decided to augment it with some actual texture. I added pieces of lace and cheesecloth, and glued them down with multi-medium. 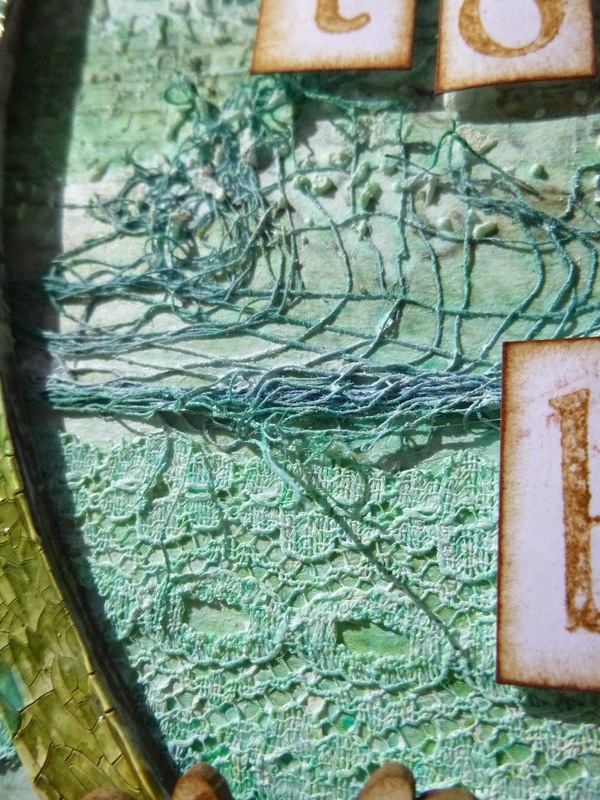 And I applied some texture paste through the Tim Holtz doily stencil in various places. ... and then set to with some spritzing and spraying and inking. ... and various other sprays including Dylusions, Tattered Angels Glimmer Mists, and Ayeeda sprays from 13Arts. 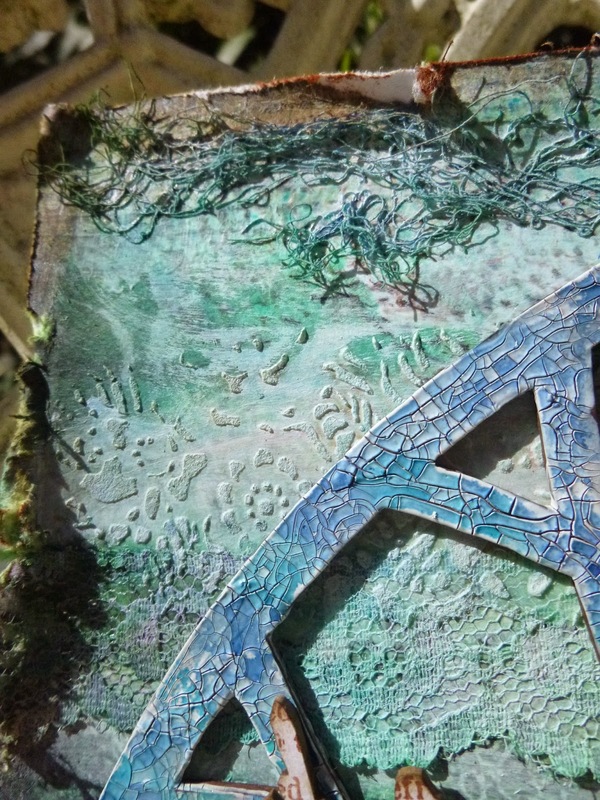 I sprayed and dabbed and knocked back and sprayed again until I was happy that my added texture looked as though it was an organic part of the paper. I glued the whole thing down to the canvas and gave the edges a good roughing up for texture and dimension. Having created such a busy background, I decided the flowers themselves needed to be relatively simple and neutral. ... and did a little light inking around the edges, and then arranged the stems around the clock face, trying to make sure they balanced nicely. 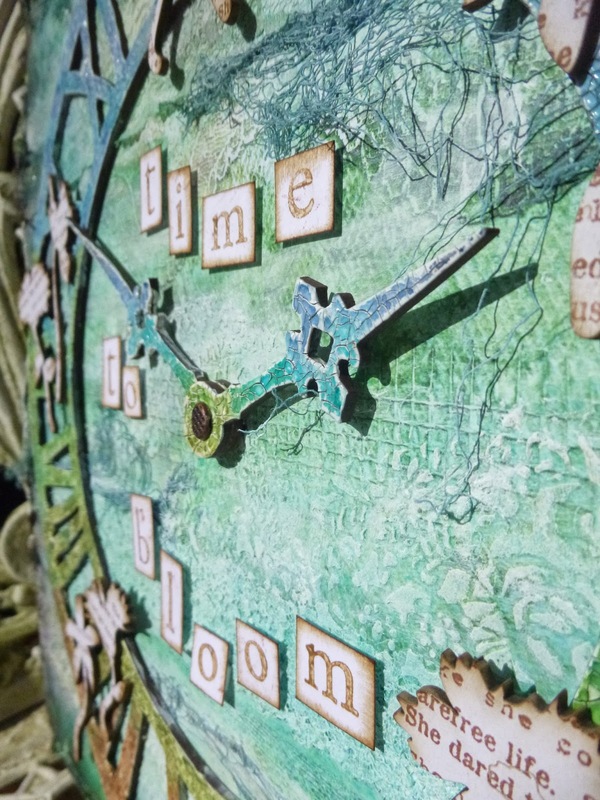 The words arose out of the two Tando products in use - clocks and flowers... time to bloom, then. ... and inked and mounted on padded tape over the textured background. The final step was to add some musical tissue tape around the edges of the canvas. Never neglect the edges! And I used the Distress Stains here too to tint the tape slightly to blend in with the main surface of the canvas. So that's my Tando Creative Canvas for you. I hope you like it (if you made it this far!). 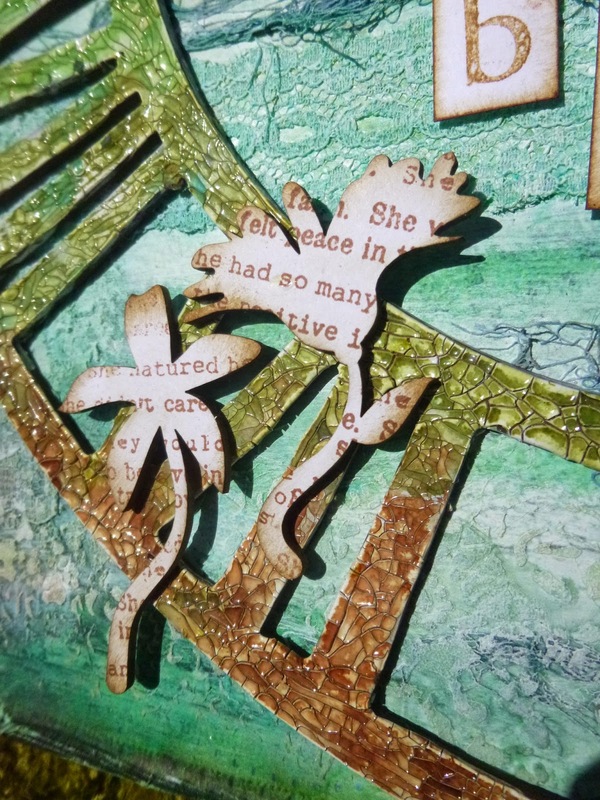 If you missed the other Sponsor Spotlights here at Our Creative Corner this month, do check out Claudia's project, and Laura's creation - they're both fantastic. And if you'd like to be in the draw to win the Tando prize package this month, there are just a few more days before the April 28th deadline to play in my With A Song In Your Heart challenge. Don't forget you need to include the song title or some lyrics on your actual creation, and check out the rest of the rules by clicking on the challenge link. Hope to see you there! Thanks so much for stopping by today. This month we are shining the spotlight on the winner of the 'No More Shopping Sins' Challenge that was hosted by Claudia! Our Creative Corner is so pleased to be welcoming Julie from "Oh Well" who won the Shopping Sins challenge with her gorgeous card. I'm a 40-something school secretary, wife, and Mum of two, living in Dublin, Ireland. 2.) Describe yourself in five words? Yikes, what a hard question!! Hmmm, what can I say - optimistic, detail-obsessed, good-humoured (mostly! ), procrastinator, bookworm. I've been into art my whole life - as a child, I was always drawing and colouring (a bumper pack of markers was always a constant on the Santa request list!). I went to Art College after school, did Graphic Design, but the constant deadlines actually killed my creative urge for years, and I did nothing more until after my children were born. Discovering stamping and card-making rekindled my interest in making things about 10 years ago. 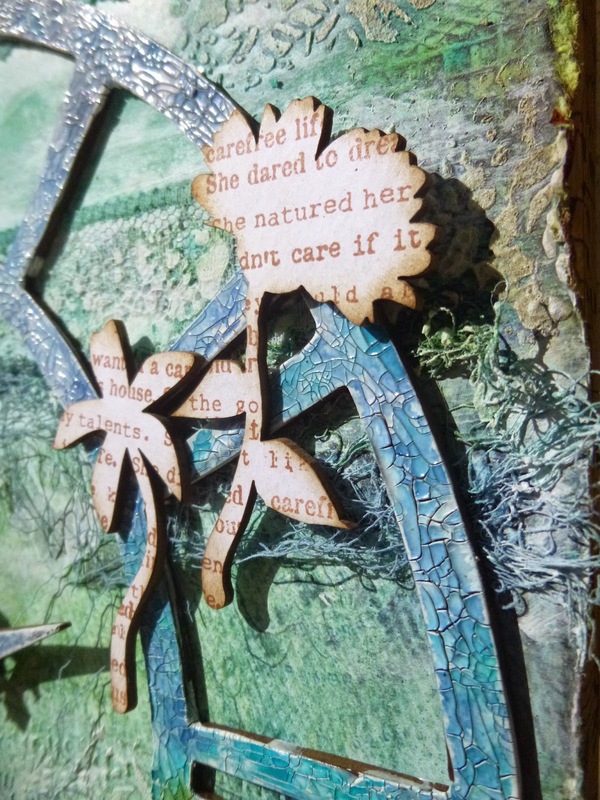 I've also dabbled in scrapbooking and mixed-media. 4.) What colour do you hardly ever use? I am endlessly in love with patterned paper, inks, buttons and colours. I love interesting colour combinations but, like many crafters, I have difficulty using yellow and purple - I don't think I've ever made a purple card!! I used to do a lot of time-consuming hand-stitching on my cards, and I loved the effect - but eventually I had to stop, as the hours I put into each card were getting beyond ridiculous. I bought a "Sew Easy" when they came out, thinking that would speed things along, but hated it, it didn't punch the holes close together enough for me, so I sold it to a less pernickety friend. 6.) Is there is tool/item that you are drooling over at the moment and wanting to buy? 7.) 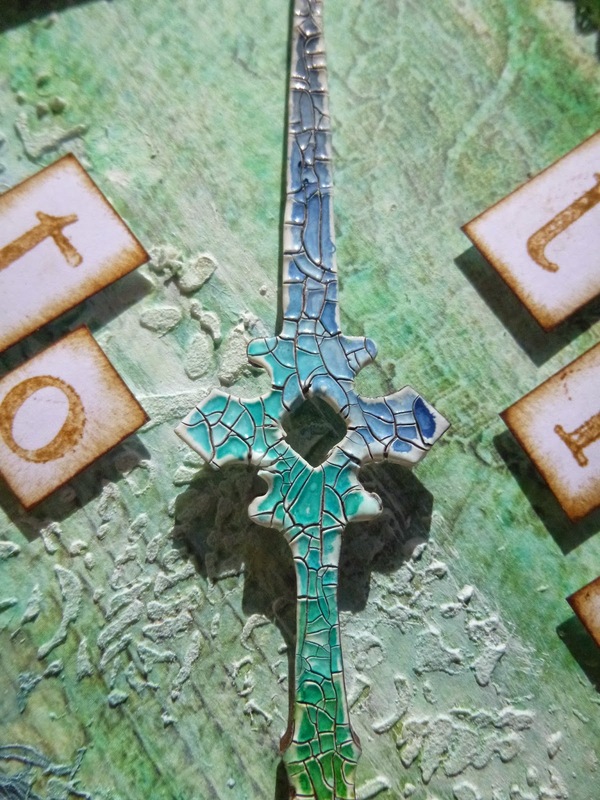 What do you enjoy most about crafting? My favourite thing about crafting is when friends and family open cards I've made for them - I love to see the pleasure on their faces. I'm also glad to have met many lovely new friends through this hobby. Julie has created such a lovely card for all of us to see - how cute is this? Thank you Julie for being a wonderful Top Talent in the spotlight for us today..... and thank you also for taking the time to design such a gorgeous project for us. It has been such a pleasure to feature your work. 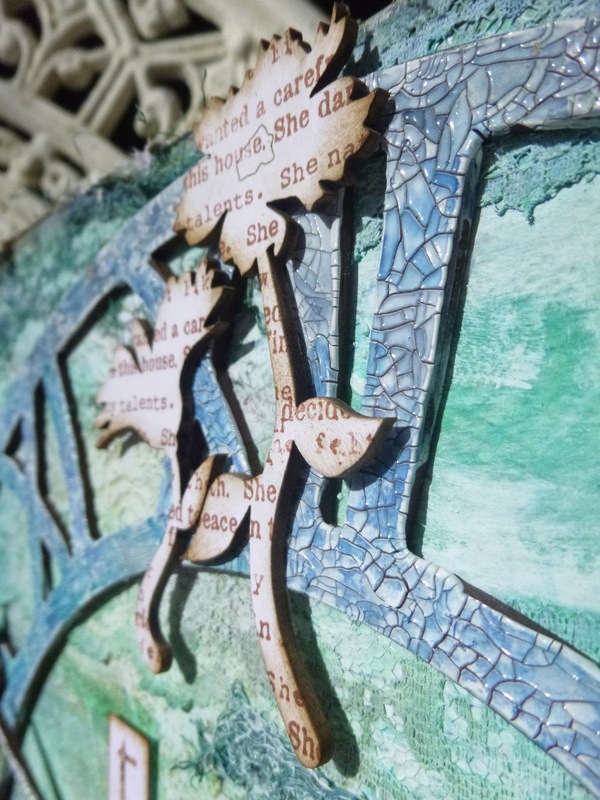 If you want to see more photos and details of how it was made, then please go along to Julie's blog "Oh Well" and say "Hello" - I am sure she would love to see you there! 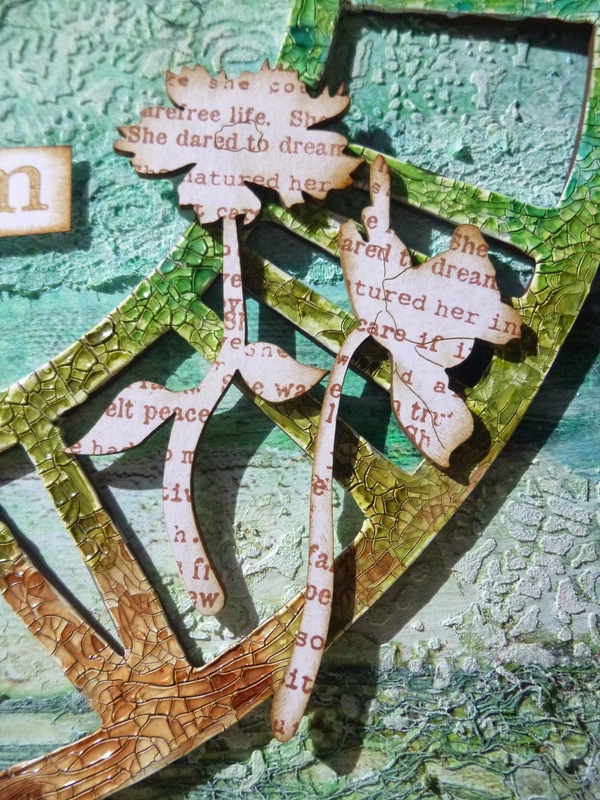 There is one more week of Alison's challenge left, so why not have fun creating! 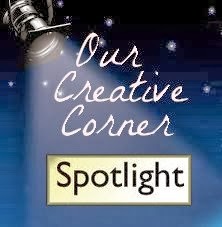 Don't forget to come back on the 25th when you will find Alison here to show you her wonderful Tando Sponsor Spotlight! Tando Creative Sponsor Spotlight No.2 - Any Cheering Up Needed? Servus, dear visitors and friends of Our Crafty Corner! Claudia here to share with you a creation made from another product from this month's generous prize sponsor Tando Creative! Before I assembled the tray I used one of the window layers as a template to mark the four background panels on a colour copy done from one of my abstract paintings. Next I assembled the printer tray and gave the insides and outsides of the frame a thorough coating with white Gesso. I also swiped some of it over the front as a sealant for the next step. The front of the frame was given a coat of Distress crackle paint "picket fence". While this was set aside to dry I stamped my favourite friendly monsters (from Stampotique) onto some white card and fussy cut them for later use. ...and whiped the excess off with a damp cloth to make the tiny cracks more visible. Time to insert my four panels and glue them in place. My friendly monsters needed a bit of colouring, so I grabbed some brush tip pens and lightly added some colour here and there. Then I typed my saying on the computer and printed it onto some heavy printer paper. Afterwards I cut out the single words and blended the edges with Distress ink "black soot" before I attached some cut to size sticky foam pads to the backs. My monsters were treated the same way (I'm afraid this one didn't like what I did to it as it looks a bit grumpy). After glueing them in place I browsed my stash of cut out "happy mess circles" - circles I randomly cut from scraps of my more colourful experiments (originals and colour copies) and stash for later projects. After I had chosen three, I placed them (right side down!) in the tray's compartments. No measuring needed at all and my popping circles were in perfect place so the cover could be closed and opened easily. Yay! ...and for a finish I added some spritzes of Distress stains (using a thin detail brush to sprinkle them on) and one of my coloured monster cuties. The cover was done merely the same way, but I glued the cut out circles flat to it instead of using sticky foam pads. Then I covered the remaining sides of the printer tray with white Gesso and let all dry. My "Cheer Up Monster Frame" was done! Yay! or make Top3 or maybe even win the challenge and therefor get featured with our Top Talent, guesting in an extra post on OCC! Alison (and the rest of the team of course too) is desparate to learn which songs you chose (don't forget to mention them in your posts) and which projects they inspire in you! There's still a bit more than a week's time to join in our actual challenge!